Our renovation project on the third floor continues, and it looks like everything's on schedule to be finished by the holidays. 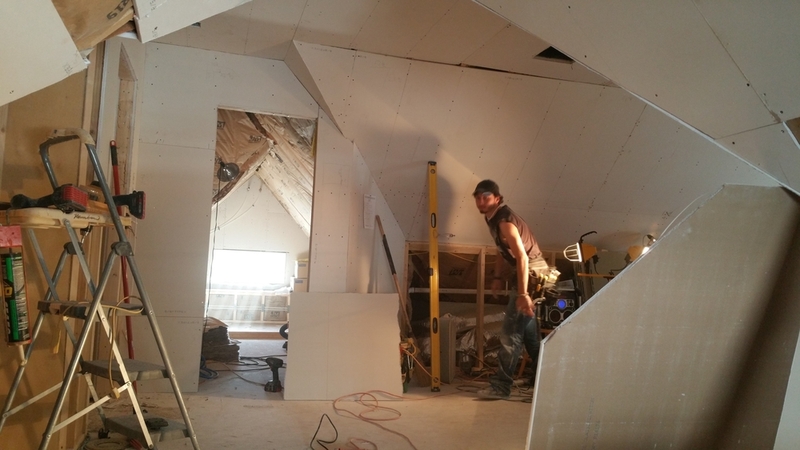 The building crew has finished insulating and soundproofing, and they're on to hanging sheetrock. The bathroom is also coming along, with everything plumbed and ready for wallboard and tiling. Speaking of plumbing, we're all set for a pretty luxe vertical spa setup in the new suite. Set under the west gable, the jetted shower will use Delta's TempAssure and H2OKinetic system, with two shower heads (one fixed, one hand shower) and four body jets. It's a thermostatic system designed to keep the water temperature constant, even if there's a change in the incoming water. That means the temperature can be set to remain consistent from one shower to the next. We'll have a separate clawfoot tub for guests who'd rather just soak for a while. It's a slipper style cast iron tub, with a raised end that makes it more comfortable for lounging. It'll also have a telephone-style hand shower. We've received the marble-top double-sink vanity, but we're still waiting on the toilet for the water closet. Speaking of the water closet, we're pretty excited about the exposed brick chimney at the back. Yeah, it's probably the least-glamorous feature of the whole bathroom, but we fought pretty hard to keep original architectural elements of the home as front-and-center as possible. It'll definitely be the best bathroom in the house, and perhaps one of the swankiest bathrooms available for guests in Deadwood. We'll post more pictures after the tile starts to go down. In the meantime, our work crews are in the house between 9 a.m. and 5 p.m. They've been pretty good about keeping the noisy work to a minimum, but we appreciate everyone's patience with the extra dust and inconvenience. We've had some really understanding and easygoing guests this summer; you're all awesome!